I went to Hurricane Club on Saturday night with a group of about 8 or so and just had to write about how much I loved it. It’s an upscale place with a sophisticated crowd and you can just walk right in, no lines or bouncers. 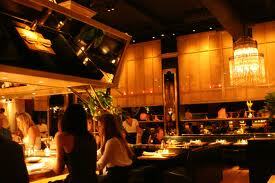 The reason is because this is kind of like STK where it’s a restaurant and a bar. If you like STK, you’ll love this place. I would say it’s appropriate to anyone in their late 20s on up. Primarily it seemed like there were 30s and early 40 year olds on Saturday. The drink and food menu has a tropical Hawaiian feel, which doesn’t really fit the venue in my opinion, but everything was still good. The only thing that was a little odd was the tightness around the bar. We were a group of 8 and we couldn’t really hang anywhere without impeding traffic, which was annoying, so maybe only bring 4 or 5 friends ;). Apparently this place is best on a Thursday or Friday. On Saturday we noticed it was really dying down around 12am, so keep that in mind when planning out your night. I highly recommend visiting this place before the Summer is over. Cheers!